Preparing this dish is going to take a bit of time on your part, because it simply takes time to broil, peel and chop the eggplant. It is, however, well worth the time investment, as you will end up with a richly flavored side that is really quite special. Nothing else about this dish is particularly difficult, and after you make it once, you will probably be quite comfortable adjusting the ingredients to customize the flavor. For example, in the version that we prepare, we use less walnuts and also prefer dried cranberries instead of pomegranate seeds. Try either the version below or the original that Suzanne Husseini published in her book, Modern Flavors of Arabia . This is an excellent book if you are interested in exploring this type of cuisine or simply like the blend of flavors represented by this dish. There are only a couple of tips that I can provide to help you out with this dish, as it really is mostly a chop and combine sort of experience. We have found that broiling the eggplant until it is charred (a common instruction) takes things too far. We don’t like the eggplant softened that much and the skin is a little hard to deal with when it is scorched like that. Instead, we broil the eggplants until the skin has darkened and wrinkled, but not charred. 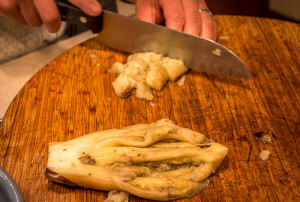 When poked, the eggplant should be about the same firmness as the inside of your forearm. Make sure you let the eggplants cool pretty thoroughly and they will be much easier with which to work. Another thing to keep in mind for this dish, is that that the eggplant chunks are quite delicate once broiled. Be gentle when you incorporate other ingredients otherwise you will end up with mush. Be gentle and you will be rewarded with a nicely textured salad that has distinct cubes of softened eggplant…mush more pleasing. I hope that you give this dish a shot, even if, like me, you are not a huge fan of the eggplant. It is a great blend of flavors and, if nothing else, the pomegranate reduction is worth getting to know. Leave a comment once you have tried it. The reduction keeps for many weeks and can also be used as a simple salad dressing. Pierce eggplants thoroughly with a fork and broil in oven (on a baking sheet) until skin is darkened and the eggplant is the firmness of the inside of your forearm. Periodically turn to keep even. This process should take 20 to 30 minutes. Remove from oven and place on rack to drain and cool. When cool, slice lengthwise and remove the skin and the seeds. Chop the eggplant into chunks and place in a medium bowl. Add the green onions, garlic, lemon juice, and season with salt to taste. Finally add the tomatoes and walnuts. Gently toss to incorporate. Set aside for about 30 minutes in the refrigerator to allow flavors to blend. 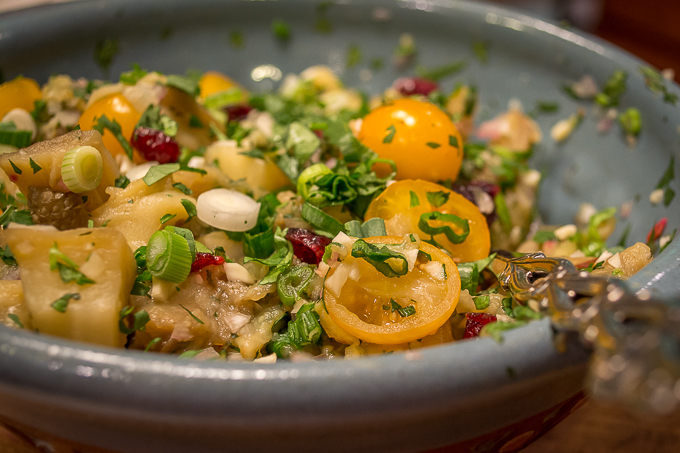 To serve, top with cranberries and cilantro. Drizzle with pomegranate reduction (below) and olive oil. To make pomegranate reduction, combine pomegranate juice, sugar, and lemon juice. In medium sauce pan bring to a boil and reduce severely. This will take approximately 30 to 40 minutes. When sauce has reduced and thickened to the point that is coats a spoon and resembles a medium syrup, remove from heat and cool.